The State Duma of the Federal Assembly of the Russian Federation expresses its categorical disagreement with the practice of double standards and discrimination of Russia, expressed in the adoption on April 10, 2014 of the resolution 1990 (2014) by the Parliamentary Assembly of the Council of Europe (PACE) on “Substantial revision of the previously approved powers of the Russian delegation”. Going on the heels of those political forces that are reviewing what is happening in recent months in Ukraine through the prism of the new “cold war”, the PACE imposed by the end of 2014 sanctions against the delegation of the Federal Assembly of the Russian Federation. Having entered the path of ultimatums and prohibitions, depriving Russian parliamentarians of the right to vote, participate in the work of the governing bodies of the Assembly and its observation missions, the PACE members who voted for the imposition of such sanctions closed themselves and for the whole Assembly the opportunity to participate in solving the most complicated problems of peace and security , which arose in connection with the Ukrainian crisis and the threat of civil war in the center of Europe. Russophobic rhetoric and direct insults to the Russian Federation and its people, voiced in the Assembly with the complete connivance of its leadership, make it doubtful whether the PACE can conduct a pan-European inter-parliamentary dialogue in accordance with the ideals and principles of the Council of Europe. When discussing the situation in Ukraine, the majority in PACE deliberately went about distorting and denying obvious facts, preferring to turn a blind eye to manifestations of racism and xenophobia from ultranationalist organizations, to an unconstitutional change of power in Ukraine, to killings and direct violations of human rights and fundamental freedoms, committed by the supporters of the self-proclaimed Kiev authorities, to its refusal to conduct an independent, objective investigation of the bloodshed in Maidan, thereby the majority in PACE went on the way edatelstva the rule of law and respect for human rights and fundamental freedoms. It is these principles that the Assembly is called upon to protect. 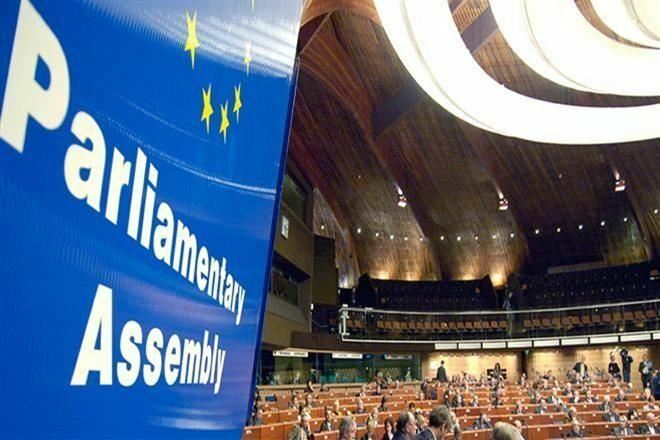 There are representatives of sober forces in PACE who offered an unbiased understanding of the events taking place in Ukraine and insisted on not closing the door for a serious dialogue with Russia by depriving the delegation of the Federal Assembly of the Russian Federation of most of its powers in the Parliamentary Assembly of the Council of Europe. However, the majority in the PACE took a different path. At the same time, the State Duma deputies note that Russia was particularly targeted by representatives of those states that participated in the aggression against Iraq and the occupation of that country, bombed Serbia and its capital Belgrade, and rudely distorted the content of the UN Security Council resolution, bomb war against Libya. Over recent years, these states have repeatedly and knowingly violated international law, their actions have led to great blood, tens and hundreds of thousands of victims, huge destruction. Because of this, they have no moral right to judge Russia and take sanctions against it. The deputies of the State Duma declare that under the conditions of repressive restrictions against the delegation of the Federal Assembly of the Russian Federation, it is not possible to continue constructive participation in the work of the PACE. At the same time, the budget allocated by the Russian Federation to finance the Council of Europe, whose parliamentary body is PACE, could be used more efficiently in the Russian Federation. Indispensable conditions for the full-fledged work of Russia in PACE are the restoration of the full powers of the delegation of the Federal Assembly of the Russian Federation and the possibility of its participation in the development and adoption of decisions of the Assembly. Any proposals to “resume dialogue” in conditions of sanctions and discrimination against Russia are not acceptable. The PACE should realize that only on the path of Russia’s constructive participation in the PACE’s activities can the Assembly play its role as a pan-European inter-parliamentary cooperation body that promotes the ideals of equality, the rule of law and respect for human rights and fundamental freedoms. Any other way leads to a political impasse.